I'm using the black leather back. I also have the red leather and metallic grey back. Inspgadget113 and TatumHargitay like this. This bumper case on the orange leather back. VZW Black Leather. 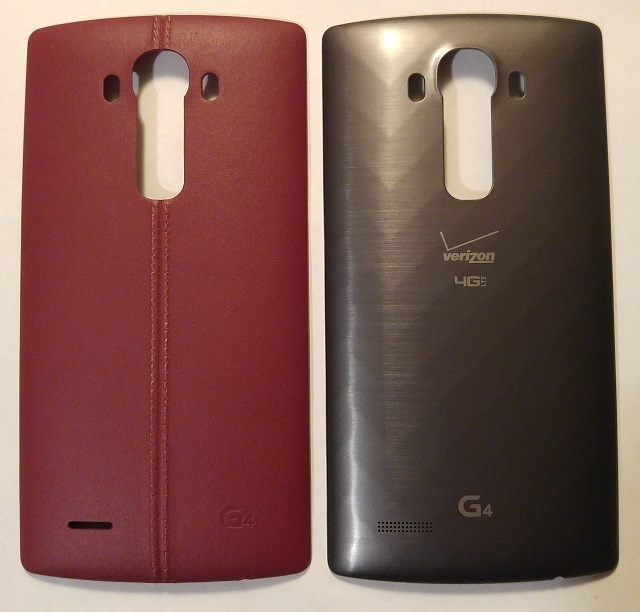 Orange Leather on order from LG. Tan back on T Mobile. I've got a black leather back I'm sitting on. I'm sure it's gonna come in handy. And I'll probably have this phone until the 2016 Nexus so I may get another back. That's the plan at least. VZW white ceramic. Want a leather back but haven't pulled the trigger yet. How is the red leather? I'm waiting for it from the fee promotion. Currently the Pink leather back! Currently using plastic cover that came with it along with the clear UAG case (same as in pic above). Once in a while I'll change to the black leather cover. I'm using an Otter Commuter case. 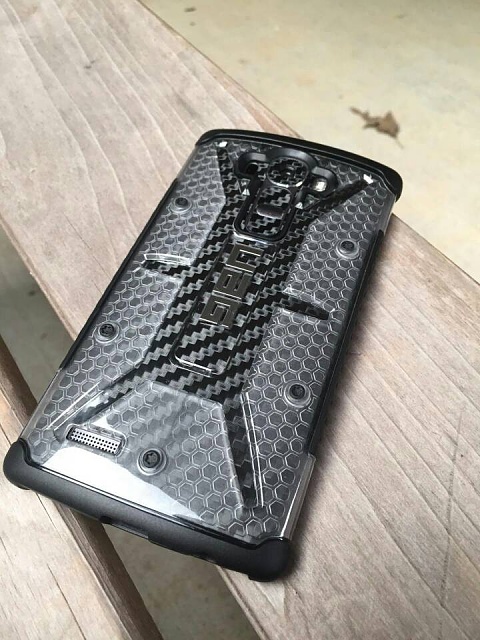 Can you post a link to the carbon fiber case? Does it protect the phone good? Oh I forgot to add, with the Qi Charging pad! I have another Qi sticker for the additional back that LG will be sending me. 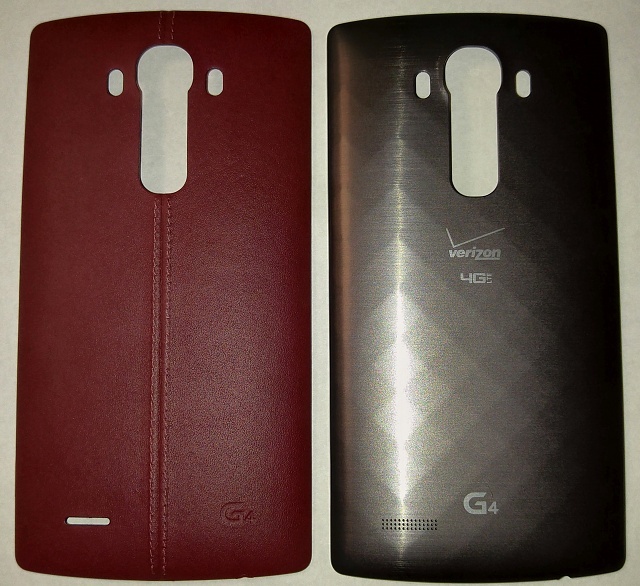 T-Mobile brown leather, and LG's red/maroonish leather. Bought the phone with the simple plastic back. I use a spigen slim armor case all the time so I don't mind the plastic back. I actually really like the plastic because it keeps the phone lightweight, and it is still very durable. I have the VZW with the Black Leather. Also have the sky blue and red leather backs from the 2 for 1 back promotion. The red is darkish and the leather has a smooth texture. The sky blue is a little darker than a sunny day's sky, but I actually like the shade of blue, and it has a grainy texture just like the black leather back. Those two are spares, or if I just feel like changing colors for a while. I have grey plastic with a Spigen Slim case, and also just got the red leather a few days ago. I like the leather, it feels nice, and it looks good. We'll see how it holds up. I may try another leather back, with the tougher grain style found on the black leather. Probably would go with orange or yellow. Yellow seems like it might show the dirt more than orange, it's too bad the black leather isn't part of all of LG's promotions. I am going to pick this bumper up as I just got the orange leather back and I think the leather back looks sweet but I worry I'll drop the phone. anyone want to trade a red leather for a yellow leather? I may put my red leather back on the phone one day but it won't show under the case. I will still have the warm and fuzzy feeling knowing it is there. Would like to see a photo of your red leather. I got the black leather in store, and it came with a promotion for an additional leather case. I was hoping for a dark brown option, but my choices were limited, and I ended up choosing red leather because it looked like it was going to be a burgundy red based on the photos. I really hope that's the case, because bright red isn't "my thing". I have the red also. it is more of a burgandy. it's not bright at all. its classic looking and on the darker side like a brick red. It's kind of a deeper, darker red, not a bright red. Burgundy? Could be, I suppose, I'm no expert I don't know if I'd say it's quite as dark as that. One person's picture recently had made it look kind of pink; it doesn't actually look pink in real life. If it's helpful, these show the red leather back against a white-paper background, along with a grey plastic back. Trying to provide a color "frame of reference" in the picture, to provide some sense of how this picture reflects reality. The first picture used the flash, the second did not. If anyone has a picture of the orange, I'd be interested. Is it a bright orange? Or closer to tan? Moto G (3rd gen): Will you be getting the 1gb or 2gb version? What market is the Moto X Play intended for? How do you get Sprint Connections Optimizer to stay off? Why do I get an error message when trying to send an email in my gmail account?